Most social functions today seem to revolve around food and/or drink. I believe there’s a time and place for everything, and it’s up to us how we choose to handle the options at these gatherings. We don’t need to embrace them or shun them, but rather find a comfortable balance among them. Wine bars, coffee houses, and jazz clubs aren’t going to disappear. There will always be office donuts, holidays, Girl Scout cookie sales, farmers’ market samples, pizza parties, weddings and backyard BBQs to attend, Girls’ Nights Out, date nights, etc. And you can pretty much bet that someone is always going to bring in baked goods for birthdays, regardless of your age. Yet every day doesn’t have to be a total “treat.” There will always be another party, another picnic, another carnival. So why do we, as Americans, find the need to indulge, seemingly all day, every day? Even if we’re not watching our weight and are truly living in the moment and really grabbing life by the horns, do we need to make every day into a food-fest, free-for-all? I think if more Americans knew how to flex their “resistance muscle,” maybe that would be the case. Through various exercises, Dr. Judith Beck, a heroine of mine, encourages her followers to strengthen their resistance muscle every day to help avoid making poor choices in the future. For example, the stronger your resistance muscle is, the easier it will be to resist the Monday morning muffin (just because they’re in the break room) or the bottle of wine on the table (just because your friend ordered it) or the nachos at happy hour (just because everyone’s sharing them). It’s not only about food choices. 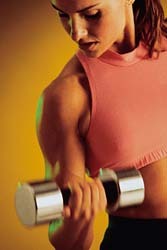 You strengthen your resistance muscle every time you choose to exercise instead of loafing on the couch. And you strengthen your resistance muscle when you make time for yourself instead of getting bogged down in life’s inevitable stresses. Essentially, we and we alone have the power to choose what foods we will put in our mouths. When I choose to eat pretzels instead of getting in my 2 tsps. of healthy oil each day, I have only myself to blame. When I reach for a York peppermint patty on the grocery check-out line, who am I hurting? Only me. According to Beck, we can’t blame food-pushing friends, PMS or anything else. We have to take responsibility for ourselves and our actions (or inactions). That said, I don’t take everything she says as written in stone. As I noted earlier, there’s a time and place for everything, and not every single special occasion merits a splurge. But I think sometimes, it’s ok –even healthy– to indulge. My husband and I got engaged in Florence, Italy, during the most amazing trip of my life back in October, 2005. Throughout Rome, Florence and Venice, I savored things I don’t eat regularly eat here–pizza, gelato, pasta, bread, etc. We walked a ton, ate a lot of fresh seafood and vegetables, and sipped a lot of Chianti. And though I’d been at goal about a year at that point, I really tried not to feel guilty because I was enjoying the overall experience so much. (Full disclosure: Ok, so there was this one night where I broke down eating tartufo at the famed Roman ristorante, Tre Scalini … We’d walked nearly an hour from our hotel to Piazza Navona to get this chocolate confection, simply because I’d heard it was “the best”–and it was, oh, it was…but I was riddled with guilt and it nearly ruined a perfect evening. Sigh). Looking back, our sacred Italy trip was not a time to flex my resistance muscle entirely, and I am proud of being able to recognize it even now. Sure, using the tools Weight Watchers had taught me, I didn’t throw caution to the wind and forget everything that had become ingrained in me. The behavior had been learned and practiced so even during “splurges” they were still within reason: not eating everything on my plate, having gelato only once a day (versus the 2-3 times a day my husband ate it! ), sharing desserts, walking a lot and drinking water when I could. But it was not a time of deprivation, and I am glad I enjoyed it. There will be other special occasions in the future, and it’s important to realize that there is, indeed, a time and place for everything…but not necessarily everything at once. Going into the weekend is always a good time to reassess your own resistance muscles, to get your mind thinking about what you really want: this moment of decadence, or the sense of pride when you say no. Sometimes decadence wins, sometimes pride wins, sometimes it’s a combination of both. This weekend is my husband’s 30th birthday. We’re going out for a nice steakhouse dinner on his birthday and hosting a party with our friends the next day. I intend to enjoy my weekend in moderation: a little decadence, a little pride. Life’s meant to be lived, and I wouldn’t want to miss out. How about you? What social obligations and/or challenges do you foresee this coming weekend? Will you think about “No Choice” to help guide you? What will you do to strengthen your resistance muscle? travel. traveling and being away from home gives me so much anxiety. i still count calories and although its not so nuts as it used to be, it bugs me to eat out for the same reason that i cant seem to moderate the larger portions very well. I found your blog via Elastic Waist, and I’ve spent the last hour reading through your posts. I feel like you’ve been reading my diary! I love thinking about having a “resistance muscle.” I know it’s just willpower, but by calling it a muscle, it makes it more tangible. It can be trained and flexed while willpower can only struggle to overcome those persistent cravings. My resistance muscle has to be worked out just like biceps & quads to get stronger! Now if only it was as simple as lifting some weights…..
Hi Amanda! Traveling is def. a tough time to flex your resistance muscle–I agree, Amanda! I try to eyeball things if I can’t physically weigh/measure them. You might find you actually know more than you think! Hi Melissa! I’m another reader who found your blog (now on my Google Reader) through your most excellent Elastic Waist post. I love your story about Florence…I lived there for a year in college and oh man, that is truly the one place on earth where it’s good to let go of controlling food, just to taste and experience so many new things. Although I like to exercise my resistance muscle, I also like to think of it as love, rather than resistance. Resistance, to me (as a former disordered eater myself), means I get into a weird self-denial mode, in which I am more attached to the feeling of superiority (however empty). Whereas loving myself is something I definitely need practice with — reminding myself that I really do love to be active, and to eat healthy foods without feeling deprived, etc. I have challenges at work where we have this monthly birthday party, and it’s always so-so cake. Although I like the idea of having something fun and sweet, I wish I didn’t feel guilted into eating something that was bought at Sam’s Club or Costco or whatever. If I want to splurge on something decadent, it damn well better be good! I think that is an added issue I have with the social pressure to eat at work functions…I’m resentful of the quality and I don’t want to be seen as “dieting” just because the cupcakes are dry! What a good way of looking at it–love! Like you, I don’t want to spend calories or points or whatever you want to call it, on a sub-par treat. I often do, though–buy SF chocolates, etc.–instead of savoring a delicious half-slice of cheesecake or something. It’s hard to splurge if it’s not “worth it!” I usually pass up stuff at work just b/c it’s never really worth it. I have come to the conclusion that it’s only people who are disordered eaters like myself who notice/look at what others are eating (with envy perhaps, disgust, perhaps…) Most people don’t really care what others eat, so don’t feel too pressured! Unless it’s worth it 😉 Thanks for writing! Fully and wholeheartedly agree with all that is said here, this may as well be me writing. You are great and I am truly grateful you decided to blog!!!!! Thanks for the inspiration :). OK, I’m back Melissa! This post has been one of my favorites I’ve read on the many blogs I read…for some reason I have really connected with it, so thanks for that :). But I’m back to say that I will be thinking about this and you tonight when I’m at a dinner party with girlfriends…flexing my resistance muscle till it’s all tuckered out, I’m sure! First big party since I’ve become recommitted…. this was a prodigious segment cheers for the help.